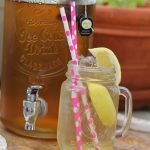 Paleo Sun Tea! Something I have wanted to try for some time now, but never seem to get my act together. A seemingly simple task: tea bags, water, a jar and sunshine, all things relatively cheap, and easy to find. Every year I think “I'm going to make sun tea!” And then it clouds over. Or I get called into work, or I want to find a fancy jar, or… I forget. FINALLY, I made it happen. 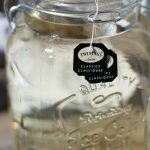 I found this fantastic jar at Homesense and was motivated by this weeks tea posts. A task to strike off my bucket list. And now I have this fancy jar, I can make Paleo Sun Tea ALL THE TIME! I am excited, that's why I am shouting! Also a great vessel for sangria or really any of our Summery Iced Teas. Do you have any amazing combinations We should try? Leave them in the comments below; I have this snazzy new jar to use. Use a container that has been scrubbed in warm, soapy water. As an additional precaution, dip the container in a bleach solution made with 1-1/2 teaspoons to 1 tablespoon of bleach per gallon of water. If the container has a spigot, clean it carefully after each use, preferably by taking it apart. 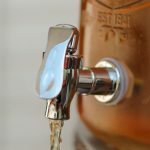 If you can't clean inside the spigot, don't brew sun tea in that vessel — find yourself something else to use. Do not leave the tea to brew in the sunlight for more than three to four hours. Do not prepare more tea than you plan to use that day. Refrigerate the drink as soon as it is ready and keep it refrigerated. ** Discard tea if it appears thick or syrupy. Those ropy strands are bacteria **I had heard a bit about bacteria growth in sun tea, but you can't believe everything you read about on the internet, (I know, shocking), this rumor is true. Please be cautious; this recipe may not be for you. I'm afraid I don't have much time to spend today, I should tell you about how my packed lunch program has been going, and the bike assembling (both relatively good), but I am rushing thru this post in order to learn how to can. I have been around while Mom and Gran did jams, jellies and canning, but it was YEARS ago. I am undertaking this project on my own. Thank goodness for the internet being good for more than just cat videos! I should get to it. Any recommendations? Tips or tricks you have for preserving? I would appreciate if you would leave them in the comments below! I can use all the help I can get! See all of the other Summery Iced Teas! Harness the power of the sun! 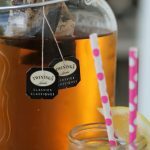 Easy Paleo Sun Tea. 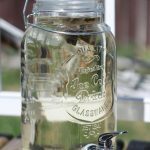 Place water into a glass jar, add teabags and cover. Place in a sunny spot for no more than 4 hours of direct sunshine. Squeeze in citrus fruit and relax into the hammock to enjoy (optional). The number of teabags used will vary depending on how strong you like your tea. Because the steeping process is gradual you won't get a bitter over brewed flavor. 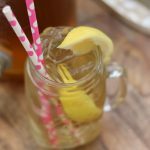 **Want to sweeten your Paleo Sun tea? 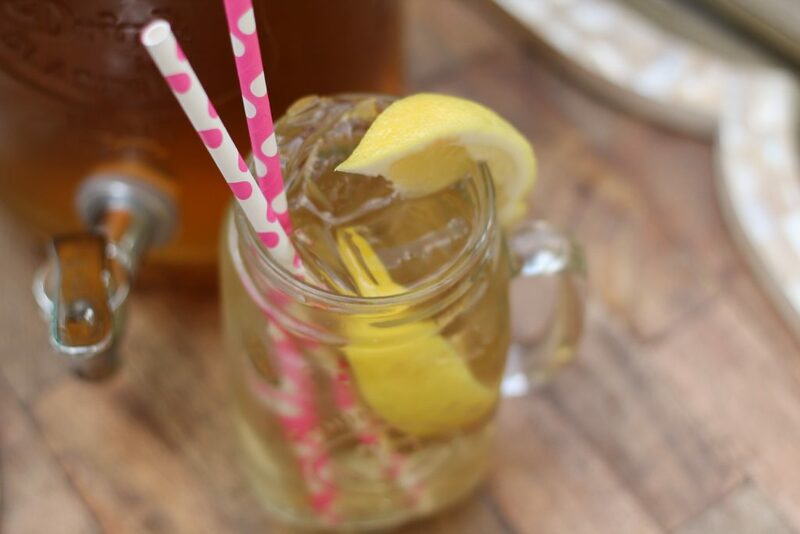 Add a little honey (honey is antibacterial) to the fresh water before steeping in the sun, stir before serving. Looks good. 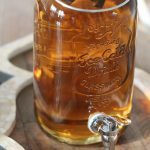 What’s the difference between Paleo sun tea and regular sun tea, if I might ask? 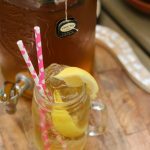 Generally sun tea is sweetened with sugar. We debated including Paleo in the title, and in the end I thought it was fair. Fair enough! It wasn’t a critique, just general curiosity. I’ve never thought of the sun tea of my youth as being paleo or anything, but I also didn’t know people put sugar in it (I mean, why? 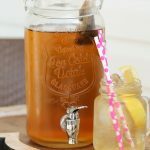 It tastes great as is), so I was just curious how sun tea could be un-paleo (in what my limited understanding of paleo is in any case). Sugar. Right. Thanks for your answer! I think it’s wonderful you asked, as we had this exact conversation, I was all: “it’s sun tea, not necessarily paleo.” It’s like labeling a head of lettuce as “paleo lettuce”. Which then, you could probably charge more for it, it’s just good marketing. Raj won me over with the sugar observation. 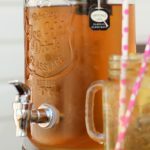 Make sure you watch for bacteria in your sun tea!! A little honey in it (anti microbial) might help! And honey is still paleo.